DELTA MED s.r.l. Italy - Meeting the highest expectations for the intravenous therapy | ARKRAY, Inc.
DELTA VEN Cannulas for intravenous infusion with Teflon (FEP) or Neo DELTA VEN with polyurethane (PUR), sterile, atoxic, apyrogenetic, single-entry, sterilised with Ethylene Oxide. Offered sizes: from 14G to 26G. The offer also includes cannulas without additional port, equipped in a grip facilitating inserting the cannula in the vein The thin-wall catheter of the cannula assures high flow; the cannula catheter has embedded X-Ray contract lines. The hydrophobic filter protects from the risk of infection. 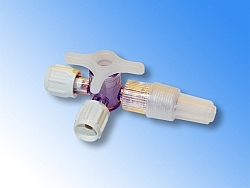 The unique design of the catheter bracket, setting the cannula at the optimum punctuation degree, reduces the tissue tension in the place of punctuation and eliminates the risk of perforation of the rear wall of the vessel. The offer includes safe-type cannulas, dramatically decreasing the possibility of accidental needle stick. DELTA Self Safe Cannulas for intravenous infusion with Teflon (FEP) or Neo DELTA Self Safe with polyurethane (PUR), sterile, atoxic, apyrogenetic, single-entry, sterilised with Ethylene Oxide. Offered sizes: from 14G to 24G. The protection activates passively when the needle is taken out of the catheter. It entirely secures the needle blade assuring effective protection. 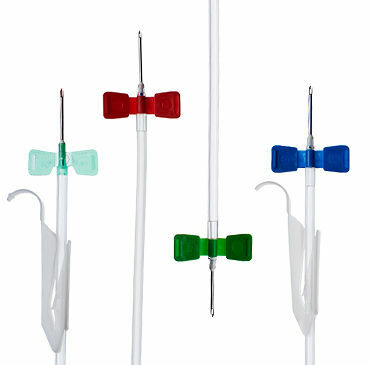 For each size of cannula (except for gauge 26)a Luer-Lock obturator is available. The Obturator is recommended in order to avoid suspension in infusion - prevents the formation of clots in the cannula lumen and eliminates the necessity of rinsing. DELTA CONNECTOR accessories allow simultaneous application of several agents for infusion. Our offer includes 3-way stopcock, 3-way extension line, Luer-Lock caps of all used types.